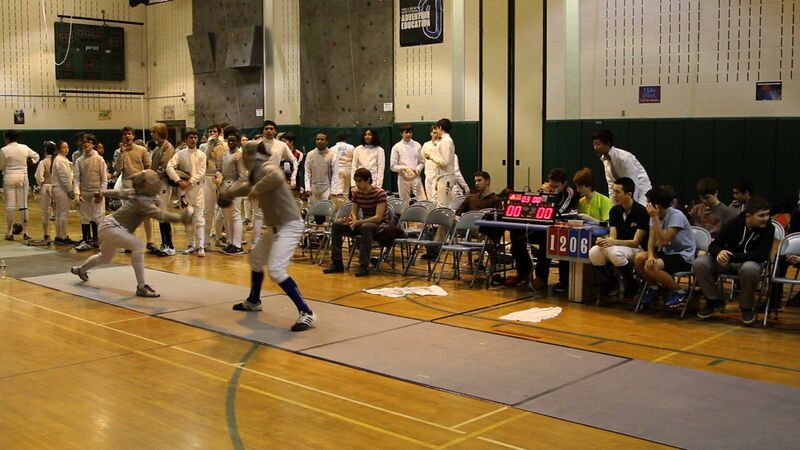 In New Jersey, fencing rules winter sports. 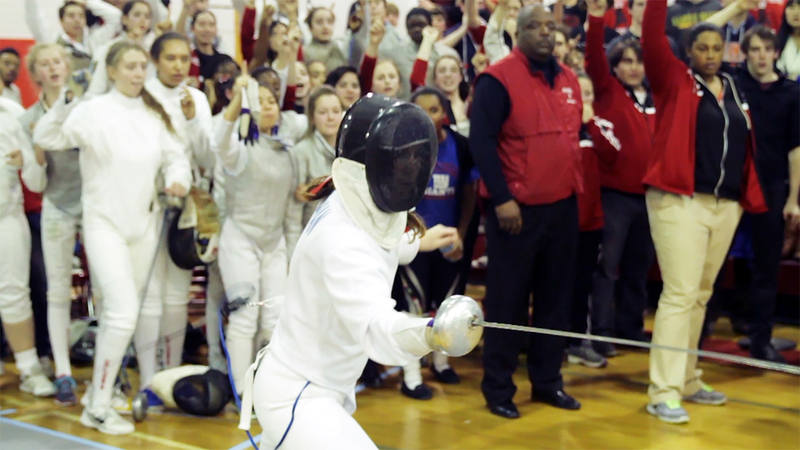 For the past 50 years, the NJSIAA has held a championship for fencing for boys and now girls. Following four teams from private and public schools, we learn there’s more than a championship at stake. 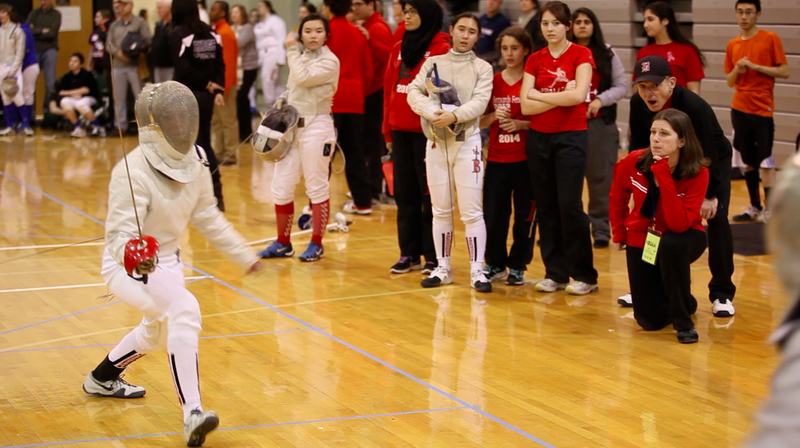 With the highest graduation rate in the country, many kids turn to fencing as a college resume booster. They soon discover that fencing is uniquely physical and requires strength in both body and mind. 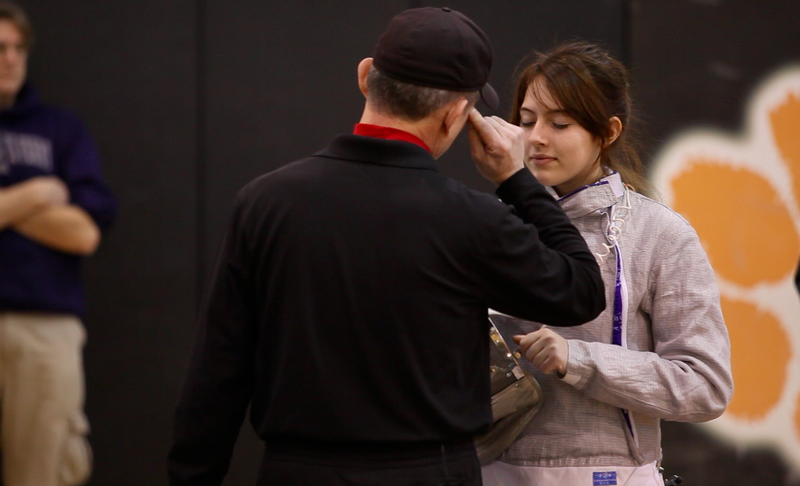 With added emotional pressure during competition, the fencers must learn the discipline and fortitude that comes with facing challenges or risk losing the match for the entire team. How they recover from loss will define their character forever. 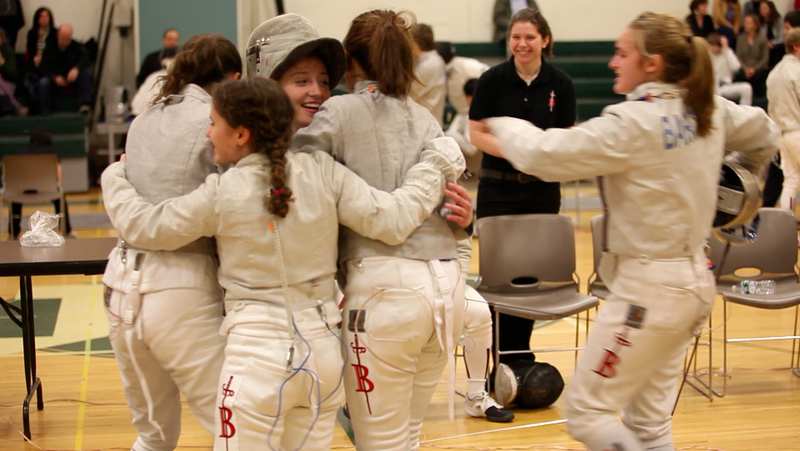 From the first day of practice, we followed the 50th anniversary fencing season with two girls teams to the State Finals. The matches are as loud as any large basketball game kids scream after touches in moments of celebration while others cry out in frustration for their mistakes. 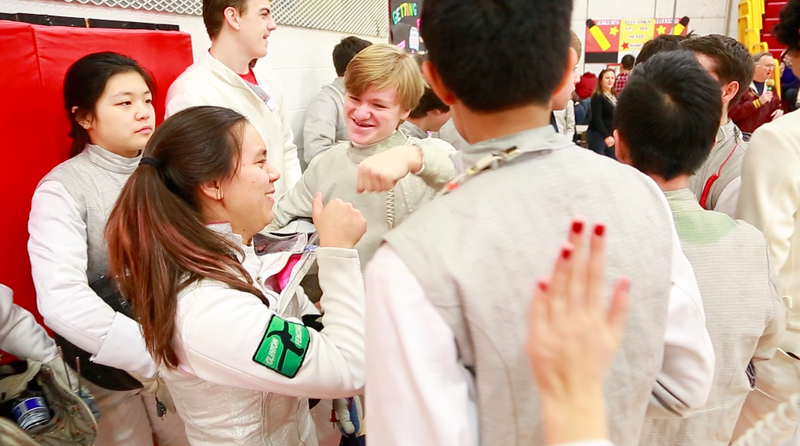 With several state competitions to test their skills, the fencers must prepare for challenging opponents, wavering referees, and day-long events. The season runs like a marathon with Columbia and Bernards leading the pack. A pit bull coach leads the Bernards team towards a rivalry match up with Columbia, the state’s perennial powerhouse with “a target on their backs.” The true test of sportsmanship for these athletes will be how they react and continue to play the sport in the face of adversity. Holly Buechel is an emerging filmmaker from South Orange, NJ and award-winning director living in New York City for her short, “Speed of Fencing.” Holly Buechel’s first short film, “Speed of Fencing”, received honors at the Big Apple Film Festival for Best Experimental Film in 2012. Holly’s vision for Speed of Fencing shows the fencing in super slow motion for the first time in history. The film has toured the country in numerous festivals and has increased the profile of the sport. 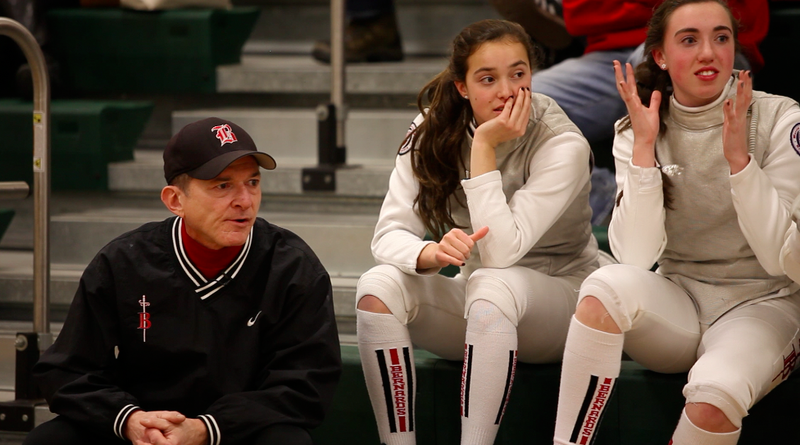 As a competitive fencer and filmmaker, Holly continues to explore the visual challenges and stories in the sport of fencing. She has also won a 2013 Silver Telly Award for her editing work on educational Internet videos for the NEA’s STEM initiative. As the Assistant Editor on several feature documentaries, including Bully, First Position, and Alive Inside, Holly has worked in every aspect of post-production. She completed her MFA in Media Communication Arts in Video Editing at CUNY’s City College of New York. 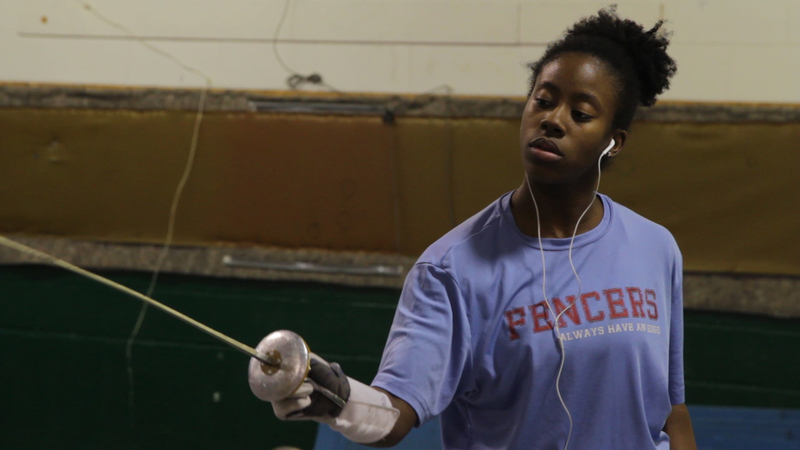 I just submitted "Fencing For The Edge" to @docnycfest via https://t.co/kDkQnfREKe! It's finally Spring and we're moving along the long road of editing the film. With renewed energy and motivation to highlight women in sports, we are including an historic component in the film. 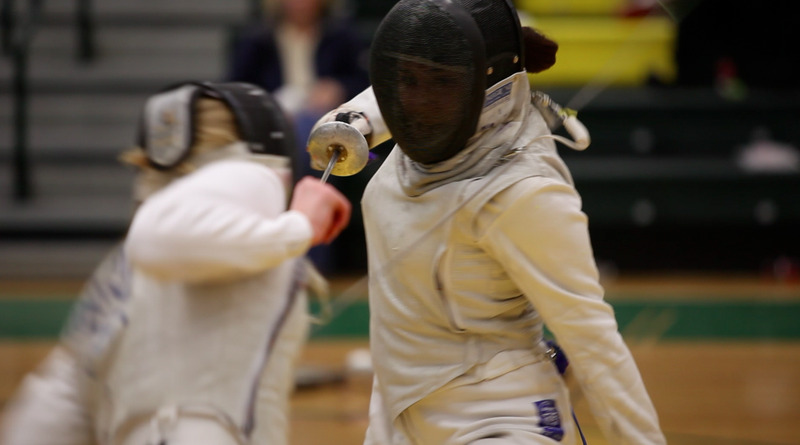 Did you know, the longest-running American fencing tournament is the NIWFA championships for women? Started in 1929 by Julia Jones, they only had foil but now hold contests in all three weapons. I recently interviewed Denise O'Connor and learned all about it! Shaping the film hasn't been easy, but now that we have decided to focus on our four girls teams we have a clearer direction. 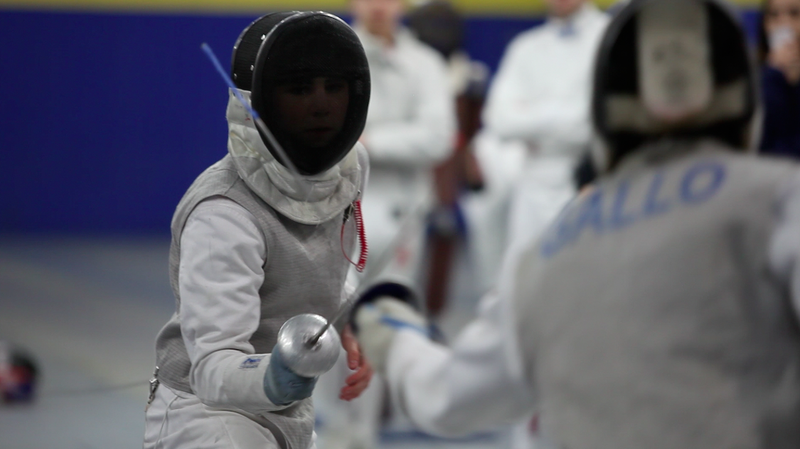 Using the 2013-14 competitive season to frame the story, we'll be exploring some of the history in the sport and how fencing has evolved to a nearly gender equal sport today. 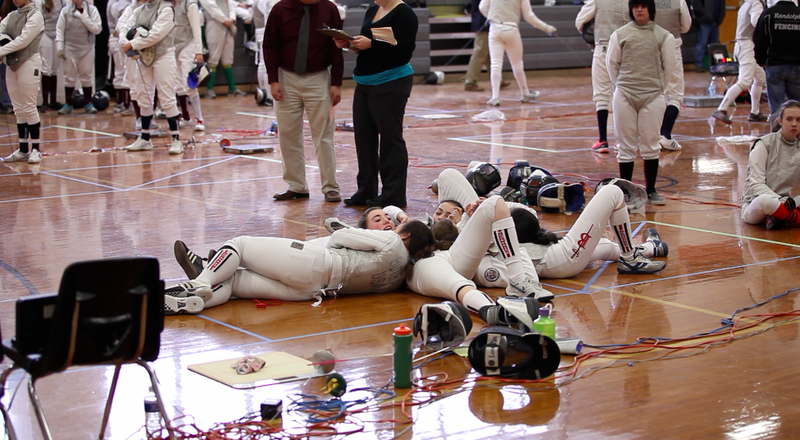 Culminating in the team finals, we have an exciting documentary on our hands and are working hard to complete it! 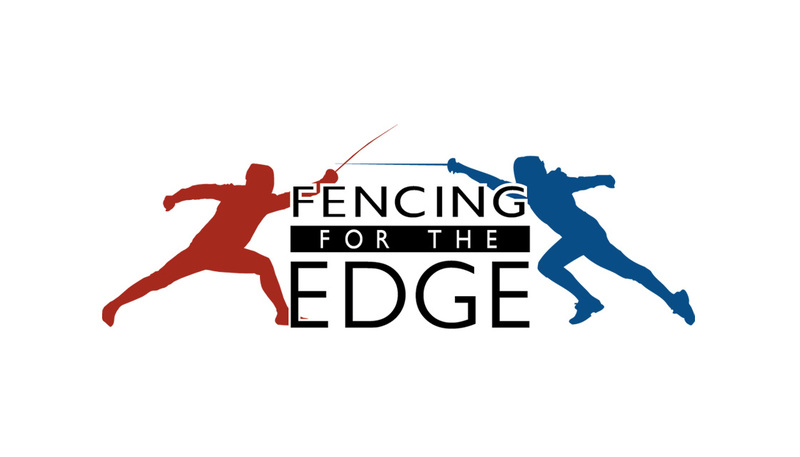 It's been a while since we've sent out an update so I'm happy to say we are well into the editing phase of completing Fencing For The Edge! We also have a new intern from Ramapo College helping us out in post-production! Our goal is to reach a rough cut by the end of 2016, with a more hopeful goal of being able to screen test some of the film by the end of the summer. With the 2016 Rio Olympics right around the corner, the end of the year would be a perfect time to start submitting to film festivals. That is, if we finish the film this year. Working on the film hasn't been easy. We have been applying for grants from all the typical documentary funding sources and are realizing that it's harder to get a grant that it is to get accepted to college! But with our fiscal sponsor and encouragement from Women Make Movies, we are moving ahead with another round of grant applications. The film has changed from the original goals we set forward in production. Now, we have a new focus on women in sports and will be highlighting the stories of the girls teams. This is not to say the boys will be cut out of the film, but for a more focused story and for run time, we will need to stay with the girls. This was a tough decision for me as the Director because I wanted to tell a story with gender equality as a theme. But I also realized that highlighting women in sports is a way that gender equality can be achieved in the greater scheme of sports. The girls teams we filmed interact with their boys as teammates and practice partners, which is something I wish all sports offered. So by focusing on the girls, we are now able to approach different funding options and a womens issues subject and appeal to specific funders with the same goals. If you or someone you know would like to be involved in our funding endeavors, please reach out to us! We have a long road of editing ahead and we don't want another year to go by before the film is finished. Thanks for your support and stay tuned for more updates! Today we're proud to announce our IndieGoGo fundraiser! We need to raise $45,000 to reach a rough cut of the film and cover the remaining the production expenses. We just launched a couple hours ago and because of your support, YOU are the first to find out! Check out our page and please share with everyone you know! We have some amazing perks from OnPoint Fencing and personalized video messages from our US National Team fencers and Olympians! The perk that makes this fundraising goal the most real for me is the rough cut screening ticket perk. If we reach our goal, we will be screening a rough cut of the film at the Summer Nationals in San Jose, CA! We can't edit the film without you and would love your support on this next phase of the project! Stay tuned for more updates on perks, fundraising progress, and additional sneak peeks from the film. 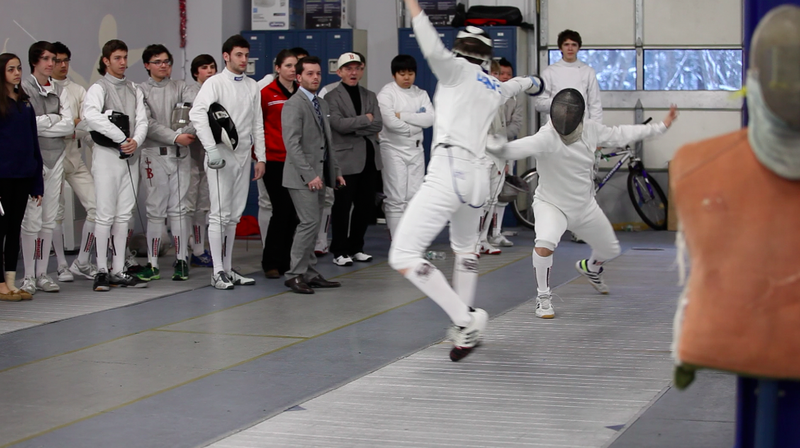 January has always been a time for fencing and New Year's resolutions for me. 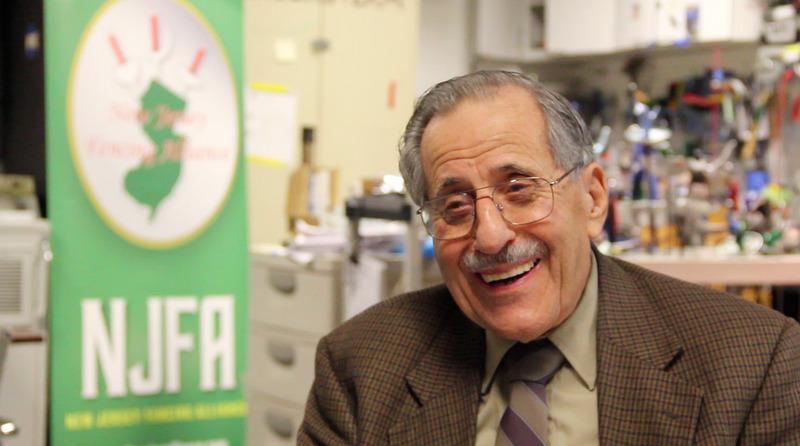 This time last year, Fencing For The Edge was in full production mode filming the 600+ fencers in each of the fencing tournaments named after icons Dr. Gerald Cetrulo and Giorgio Santelli. 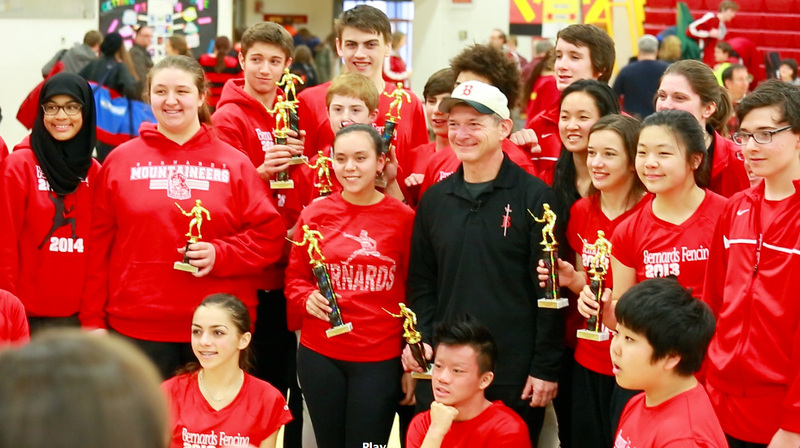 In its second year at the Morristown Armory, 48 teams competed in the season's opening competition crowning Columbia High School as the girls and boys championship teams, once again! And what's my resolution? To finish this film. 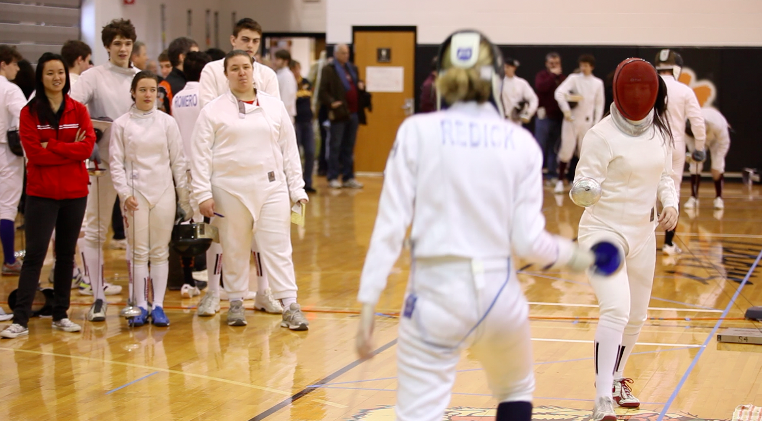 As an optimistic and competitive person, I had hoped to reach a rough cut of the film by the time the high school fencers stepped onto the strips for their next season. But without grants and financial stability, the film has taken been halted in its post-production progress. The new year has reinvigorated me to find the finishing funds for the film and to seek out new ways to complete the project. This weekend, I was invited to photograph the Cetrulo and Santelli events by the NJIFA and made two galleries to share with your friends and family. They are available for free to view and all purchases will benefit the editing of Fencing For The Edge. Look out for another crowd-funding campaign in February as well! Thanks again for your support and stay tuned for more updates on the film!